Hong Kong-based Dressale.com offers dozens of fashionable formal dresses, and if you take the time to dig through their gallery, you'll find some modest formals interspersed among the shorter styles. If you see something that you find appealing, you may want to note that some of the dresses on the website are offering in a very large range of colors. For instance, at the time of our visit, a modest mermaid dress was offered in a whopping 33 different hues, such as ivory, lilac, sage, purple, emerald and watermelon. 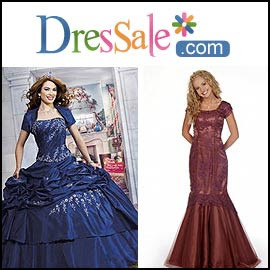 Dressale.com carries many sizes, including plus sizes. We saw many dresses for less than $150. We recommend that when you purchase a gown from an online vendor, contact them in advance about their quality guarantees and their return policies, and order well before your scheduled event so that you can make sure the dress measures up to your expectations.